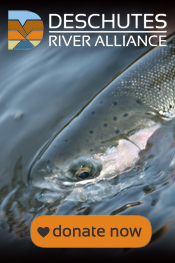 On May 13, 2016, the Deschutes River Alliance (DRA) sent notification to Portland General Electric (PGE) of DRA’s intent to file suit for violations of PGE’s Clean Water Act Section 401 Certification for the Pelton-Round Butte Hydroelectric Complex. The Section 401 Certification sets out water quality requirements agreed to by PGE during the dam licensing process and embodied in a document titled “Water Quality Management and Monitoring Plan” (WQMMP). The Section 401 Certification is a required component of the Pelton-Round Butte Complex’s operating license (Federal Energy Regulatory Commission License No. 2030). PGE’s own water quality reports provide evidence of violations of temperature, dissolved oxygen, and pH requirements at the Pelton-Round Butte Hydroelectric Project. The DRA has catalogued over 1,200 specific violations of the 401 Certification that have occurred since operations began at the Selective Water Withdrawal (SWW) Tower at Round Butte Dam on December 31, 2009. Due to PGE’s lack of willingness to openly and meaningfully discuss and address these violations, and other issues, the DRA has been left with no alternative but to seek court-ordered enforcement of the law regarding the water quality requirements. Further, DRA believes that the Oregon Department of Environmental Quality (ODEQ), the primary enforcement agency, has failed to demonstrate any inclination to enforce the terms of the Section 401 Certification. Rather than requiring changes in dam operations so as to comply with water quality requirements, ODEQ has deferred to PGE’s demands and facilitated a purported weakening of those requirements. PGE’s water quality violations are a reflection of other water quality problems now manifested in the lower Deschutes River. SWW Tower operations have impacted water quality and insect and fish life throughout the ecosystem of the lower river below the dam complex. This magnificent river, its wildlife, and the economic well-being of communities along the river are in peril. Round Butte Dam. Selective Water Withdrawal Tower and Fish Collection Facility is housed in the structure in the left of the photo. The DRA has exhausted all other possible avenues of pursuit of these issues. We have met with PGE 25 times since March 19, 2013. Since that time, PGE has refused to acknowledge its ongoing violation of the water quality requirements in the WQMMP. Our last effort included assembling the conservation groups who are signatories to the Pelton-Round Butte operating license. Collectively we met with PGE in December of 2015. Despite our efforts to continue the process, PGE has refused to meet with the combined group again. The DRA has been, and remains, supportive of anadromous fish reintroduction above Lake Billy Chinook. We feel that by addressing the water quality violations caused by SWW Tower operation, the fish reintroduction effort can be strengthened while simultaneously improving the water quality of the lower Deschutes River. The sixty-day notice of intent to sue letter is a required precursor to a citizen suit filed under the Clean Water Act. Read the whole letter here. Pelton Dam is the second of three dams that form the Pelton-Round Butte Hydroelectric Complex. In December 2015, the Deschutes River Alliance, along with other conservation groups, met with Portland General Electric (PGE) to ask that emergency plans be drawn up so that in the event that lower Deschutes River water temperatures in the lower Deschutes River become dangerous for fish, water released from the Pelton-Round Butte dam complex could be quickly cooled to potentially provide relief from heat stress. This request was made subsequent to the fish die-offs of last summer. In June and July of 2015, water in the Columbia River became too warm for upriver migrating sockeye salmon. They sought refuge in the lower Deschutes River (as migratory fish migrating up the Columbia River often do). Unfortunately, at the same time, PGE was increasing the temperature of water discharged from the Pelton-Round Butte Hydroelectric Project, using the Selective Water Withdrawal Tower. This was devastating, given that the total mortality for sockeye during up-river Columbia River migration last summer was 90 to 99% of the total run destined for Idaho. The Idaho-bound population included sockeye listed under the Endangered Species Act as “endangered.” Millions of dollars have been spent attempting to save this run of fish. It is unclear if cooler water in the lower Deschutes River would have saved many of these fish. We do know that sockeye entered the lower Deschutes River seeking refuge in cooler water. But given that there was no effort to have an impact on this event by the Pelton-Round Butte dam operators, we’ll never know if the fish could have been saved. Just days later, spring Chinook were noted to be dying in the lower Deschutes River between White Horse Rapids and Maupin. These fish might very well have become heat stressed in the Warm Springs River and subsequently, as a consequence of thermal stress, become infected with columnaris disease. They drifted downstream to the Deschutes River. Could these fish have been saved with cooler temperatures in the lower Deschutes River? Again, we’ll never know, as the temperature of water discharged from the dams remained high, and that water continued to get even warmer downstream from the dams. There was no attempt to provide safer conditions for fish. This occurred in a location where dam operations have an undeniable effect on temperature. We were subsequently informed by PGE that any changes to temperature management at the dams would have to be approved by the “Fish Committee” (a mostly advisory committee created by the Federal Energy Regulatory Commission license; the committee consists of representatives from The Confederated Tribes of Warm Springs Reservation, multiple government agencies, and a single representative of the conservation groups who are signatories to the dam operating license; the committee meets once a month and meeting attendance is by invitation only). The process in the dam operating license for responding to emergency conditions starts with a 30-day window for evaluation by the Fish Committee of the emergency situation. The Fish Committee then has another 30 days to evaluate a potential remedy for that situation. There is no deadline or benchmark for implementation of an emergency measure. Given that situation, it seemed obvious to us, and others, that these measures would be woefully inadequate in responding to another heat-related emergency, such as the one responsible for the fish die-offs in 2015. Instead, we believe that pre-determining emergency temperature management criteria, along with an operational response, would speed this process up to allow a rapid intervention that could potentially make a difference in river conditions that might increase fish survival. In December of 2015, we, along with other conservation groups, requested the company consider such needed measures. This request was evaluated for four months. Finally, according to multiple sources, and confirmed by PGE, the request was refused by the Fish Committee. On Earth Day. Shortly after the Fish Committee made this policy decision, the National Oceanic and Atmospheric Administration determined that Northwest fisheries managers must respond faster to mitigate future fish kills if similar warm-water conditions return. The above report (published in March of this year), as noted in prior DRA blog posts, was of a two-year study of the lower Deschutes River. The purpose of the report was to determine the magnitude of biological changes in the river due to the implementation of surface water withdrawal at Round Butte Dam. A baseline study was conducted in 1999-2001, which Portland General Electric (PGE) summarized in a report published in 2002. Both studies were contracted and paid for by PGE and were a requirement of the Federal Energy Regulatory Commission license to operate the Pelton-Round Butte dams. The water quality data from the most recent study can be found on pages 47 and 48 of the 2014-2015 report. The results document violations of the basin and statewide water quality standards in both years of the study. The most egregious violations were of the pH standard as established in Oregon Administrative Rules (OARs) 340-041-0021 and 340-041-0135. The Deschutes Basin Standard for pH is a maximum pH of 8.5. A pH of 7.0 is neutral (neither acid nor alkaline, greater than 7 is alkaline). There are many problems with this statement. R2 Resource Consultants are self-proclaimed experts in water quality monitoring and modeling, so one has to wonder how and why they would be unable to produce accurate water quality data? Why would they have calibration problems? If their equipment wasn’t functioning properly, why wouldn’t they use backup pH measuring equipment? If they didn’t have backup equipment, why couldn’t they borrow equipment or have it shipped in via overnight express? The pH measurement problems they most specifically refer to occurred over several days in April of 2015. That should have been enough time to correct any equipment problems. There were also very high pH measurements in the three days of sampling in April/May of 2014 (10 out of 12 lower Deschutes River sites were above the 8.5 pH water quality standard). Were their instruments faulty then too? Or is this an attempt to discard and disregard data that are indicative of water quality problems? There is another potential reason that the high pH values were recorded during spring sampling in both years. When algae bloom, it increases pH. It does this by absorbing CO2 from water to conduct photosynthesis. The by-products of photosynthesis are sugar and oxygen. Notably, the dissolved oxygen levels on the dates of the high pH levels were also high, with dissolved oxygen saturation levels reaching up to 138%. This occurs when there is excessive algal growth. We have noted extensive algae growth in the lower river this year, starting in February. We have also recorded pH levels of greater than 9 in April and May 2016. Algae, early March 2016. One mile below Pelton-Round Butte Reregulating Dam. Algae, late March 2016. One mile below Pelton-Round Butte Reregulating Dam. We are troubled by the lack of explanation for R2’s “calibration problem(s).” It is standard procedure to have a quality control plan that includes details for meter calibration and procedures if they fail calibration. At the DRA, we maintain a log for each instrument we own. Recorded in each of these logs are the calibration dates, times and results. All instruments are calibrated before each day of water quality sampling. We carry backup equipment. In the case of our in-river dwelling data instrument, once a month we perform “field audits” where we cross check the data it produces with independent meters and manual techniques. We cross check the performance of our meters. We have such a stringent quality control program because two of our field staff worked for the Oregon Department of Environmental Quality (ODEQ) for decades, doing water quality work. We exercise the same quality control methodology that ODEQ uses. We would suggest that PGE require the same of contractors doing water quality work. Larry Marxer measuring dissolved oxygen in river water, using the Winkler method. Rick Hafele doing water quality measurements on Lake Billy Chinook. Greg McMillan going old school on water quality measurements in 1979 (when old school was just school, or maybe pre-school). Antocha crane fly. Photo by Rick Hafele. Antocha is just one genus of the family Tipulidae, a group well known as crane flies. As crane flies go Antocha is rather small, and while most crane fly larvae live in slow moving or stagnant water with silty or muddy substrate (some are also terrestrial), Antocha larvae prefer riffle areas of streams with clean cobble substrate. This little crane fly is found throughout North America, including most if not all of the streams in the Deschutes watershed. Until recently it was one of the insects of the lower Deschutes River that appeared every summer in moderate to large numbers. Whether trout found it of interest could be debated, but its presence was one of those reminders that summer had arrived on the lower Deschutes – but no longer. Rick Hafele and Greg McMillan first noted the absence of Antocha crane flies in the lower Deschutes River in July of 2013. Until that time these dipterids had been abundant in the lower Deschutes River. By the summer of 2013 other species of aquatic insects had also been observed to be in decline, but Antocha just seemed to have disappeared. We waited until 2014 to confirm our 2013 observations regarding the missing Antocha before saying anything publicly. We reported our observations here in our blog, and then through the observations of others in our 2014 Lower Deschutes River Macroinvertebrate Hatch Activity Survey Results. Our reports regarding the missing crane flies were initially met with little interest, if not skepticism, by resource management agencies and the Pelton-Round Butte Dam operators, but then confirmed by the R2 Resources Interim Report in the Portland General Electric Aquatic Macroinvertebrate and Periphyton Study. The final report from that study also notes that the disappearance of the crane flies in the lower Deschutes River occurred after the inception of selective water withdrawal at Round Butte Dam. Antocha crane flies mating and laying eggs in the lower Deschutes River before surface water withdrawal began at Round Butte Dam. Photo by John Hazel. The final report from the PGE Lower Deschutes Aquatic Macroinvertebrate and Periphyton Study also mentions studies done on the Crooked River and Middle Deschutes (Vinson, 2005; and Vinson and Dinger, 2007; Reports prepared for U.S. Department of the Interior, Bureau of Land Management, National Aquatic Monitoring Center) that showed declines in Antocha populations in those rivers. It is worth noting that those studies were done in the years prior to implementation of surface water withdrawal from Lake Billy Chinook at Round Butte Dam in late 2009. The study’s authors go on to suggest that the only other alternative is that this is due to a “broader environmental pattern.” Yet they state that the Antocha population is intact in the Metolius River. In another aquatic invertebrate study of Whychus Creek, Antocha was found to be present from 2005-2014 (Mazzacano, Effectiveness Monitoring in Whychus Creek; Benthic Macroinvertebrate Communities in 2005, 2009, and 2011-2014, The Xerces Society for Invertebrate Conservation, page 58). Whychus Creek is a tributary to the Middle Deschutes River. The confluence of Whychus Creek and the Middle Deschutes River is about three miles above Lake Billy Chinook. A great deal of habitat restoration work has taken place in Whychus Creek in recent years thanks to the work of groups like the Deschutes Land Trust, the Upper Deschutes Watershed Council, Trout Unlimited, and others. The Portland General Electric Pelton Fund, along with other sources, has provided funding for this work. So in at least two other streams the Antocha populations are intact. It would be interesting to look at other streams in the basin to see what the status of Antocha is. We believe it was very hasty and preemptive to draw the conclusion that this is due to a “broader environmental pattern” when only limited data is available from other streams. Basin studies show that the Middle Deschutes and Crooked rivers have large anthropogenic influences due to population centers and agricultural runoff. That in turn results in higher levels of nutrients that lead to algae growth. As noted in our 2015 Lower Deschutes River Macroinvertebrate Hatch Activity Survey Results, Antocha crane flies lay eggs in the splash zone of river rocks. Stalked diatom algae, which have become common in the lower Deschutes River since implementation of surface water withdrawal from Lake Billy Chinook, form a barrier to the bare rock Antocha seem to favor for reproduction in the lower Deschutes River. This probably makes egg laying impossible. Stalked diatom algae covering splash zone of rocks in lower Deschutes River. Photo by Greg McMillan. From mid-November until late May the water discharged from the Pelton-Round Butte Hydroelectric Project consists of 100% surface water draw from Lake Billy Chinook. Even during summer and fall months, there is a minimum of 35% surface water draw (Pelton Round Butte Project, FERC No. 2030, Water Quality Report, 2015). We know that for much of the year, surface water in the forebay of Round Butte Dam consists primarily of water from the Crooked and Middle Deschutes rivers (Deschutes River Alliance 2015 Water Quality Report and unpublished data from 2016, pending publication in 2017). Given that Antocha crane flies disappeared from the Crooked and Middle Deschutes rivers prior to the institution of surface water withdrawal, and surface water withdrawal is heavily influenced by the water quality of these rivers, we believe that there is another hypothesis for the massive decline of Antocha in the lower Deschutes River. We propose that the causative agent of Antocha decline in those rivers is now being passed down into the lower Deschutes River as a consequence of surface water withdrawal at Round Butte Dam. That cause could be any, or a combination, of several possible agents. The first is the nutrients in surface water withdrawal at Round Butte Dam fueling the stalked diatom proliferation in the lower river, which is denying access to clean rock surfaces necessary for Antocha mating and egg-laying. The second possible cause is that a pesticide or other agent entering the Crooked and Middle Deschutes Rivers is being transferred downstream in surface water from Lake Billy Chinook. Antocha crane flies have also been found to be susceptible to parasitic infestations (International Review of Hydrobiology, Vol. 92. Issue 4-5, pg. 545-553, August 2007). This raises a host of issues that could possibly be related to the ecological changes brought by surface water withdrawal from Lake Billy Chinook. A parasite could have been transported to the lower river via surface water withdrawal at Round Butte Dam, or water conditions changed by surface water withdrawal, could now be favoring a parasite that has possibly infected Antocha. How important is the disappearance of Antocha crane flies? That is hard to tell. However their disappearance from the lower Deschutes River, and the Crooked and Middle Deschutes rivers, should be taken as an indication of an ecological change. Their disappearance warrants deeper investigation and not just casual dismissal of a phenomenon that could be indicative of a larger ecological problem.